For those in an assisted living community, seniors want to make sure they keep a strong and healthy body. They achieve this through a well-balanced diet, good hygiene, and a positive outlook on life. Thankfully, these are all provided by the staff of the senior community that they are a part of. However, one thing that seniors tend to be missing out of is exercise. 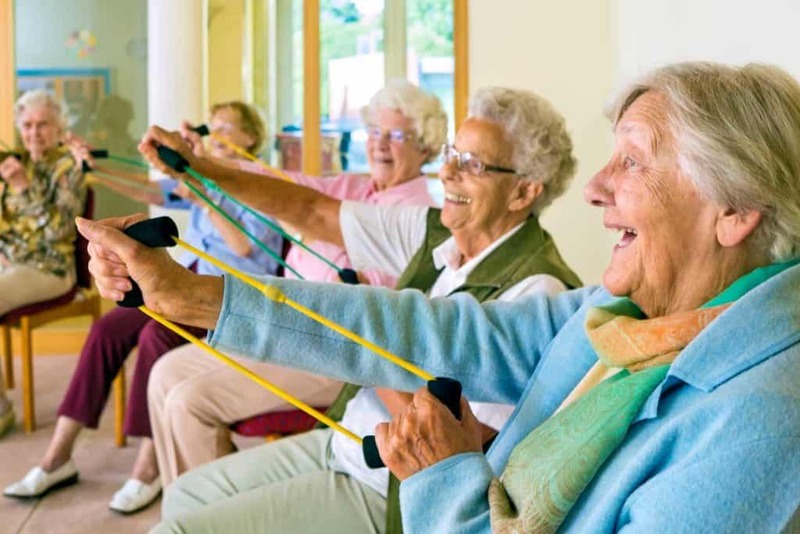 Thankfully, many communities provide a lot of beneficial exercises and activities for seniors in assisted living. 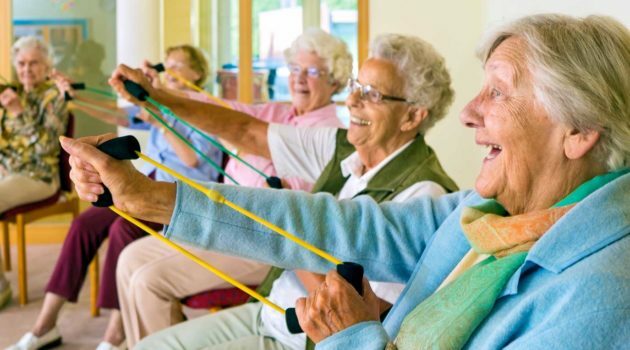 As we age, our bodies changes, making exercise crucial for everyday life, even for those in assisted living and other senior living communities. They make us feel better, make us live longer, and help lessen the impact the body feels as we age. Exercise and other physical activities for seniors in assisted living and senior care can bring a lot of benefits. As we grow older, our bones and muscles become weaker, causing seniors to lose balance and coordination. Active living can make all types of seniors be more mobile, flexible and coordinated. One of the vital organs that grows weaker as we age is the heart. However, with right living and regular exercise, the heart can stay in shape and healthy active living can fend off common cardiac issues. As seniors continue to exercise, they continue to feel better about themselves. They think of themselves better and tend to be more outgoing. 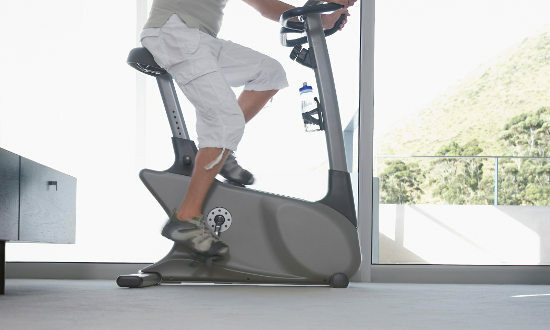 In addition, exercise can release endorphins that make anyone feel better and more energetic. There are no downsides to regular exercise as you get older and live in a senior living community. Just because your surroundings may have changed a bit, doesn’t mean you should abandon the benefits of a healthy and active living. Before you do any exercises, make sure your doctors and other health professionals you are seeing are okay with the exercise routines that you are doing. Since they know more about your body’s current state, they should be able to see what’s wrong and what’s right. Unchecked workout routines could cause issues like pulled muscles, strained joints, and other conditions. 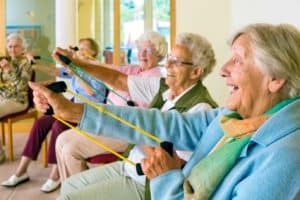 If you are part of a senior living community, it’s likely they provide daily classes for seniors to stay physically active. Most of the routines and other activities for seniors in assisted living and independent lifestyles are practically safe for the residents to perform. A low impact exercise with a range of motion, stretching is great for assisted living seniors. This is especially beneficial for those who are in physical therapy. Flexing various joints of the body like the legs, fingers, arms, and shoulders, seniors can keep their bodies flexible and enhance their range of motion. Lifting weights might not what some people of seniors doing, but it has its many benefits, even for those in assisted living. A moderate to light weight lifting routine can help any active senior. The benefits include better muscle tone and capability to lift certain objects better. Cardiovascular exercises like swimming and walking are easy for many seniors to do. A good amount of walking can make sure seniors retain their balance and stability, preventing them from issues in the future. Even if they need canes or walkers, seniors can gain a lot of benefits from getting up and moving. If they get used to it and are capable, they can even go for slight jogs. The same can be said for swimming if seniors have access to a pool. Low impact pool exercises provide better coordination but also better flexibility. The biggest trend for activities for seniors in assisted living is yoga. Yoga in a way is a combination of stretching and muscle-building. Overall, its routines help seniors relax, improve their health, and instill the mind all at once. 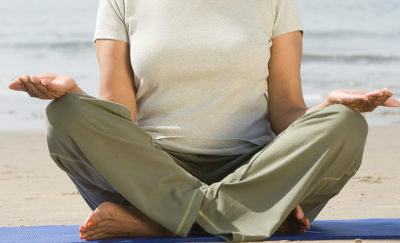 Seniors who perform yoga sleep better and feel better about themselves mentally. 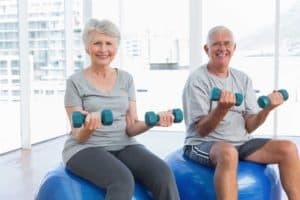 When done correctly, with proper guidance, and done in a combination of good hygiene and diet, any senior can live a long and healthy life through exercise.  Regardless if they are in specialized care or leading an independent lifestyle.